Help celebrate PlayGround's 20th season and promote what you do to the PlayGround community of theatre-makers and theatre-goers by taking out a print ad in the Monday Night PlayGround staged reading series and PlayGround Festival playbills. PlayGround playbills are 8.5"x5.5" black-and-white booklets and we offer ads in full-page, half-page horizontal, quarter-page horizontal and quarter-page vertical. Advertising rates start at $100 with special discounts available for multiple insertions and season advertisers. The new season begins October 21 with a special Monday Night PlayGround 20th Season Opener and Barbara Oliver Tribute and continues with Monday Night PlayGround performances on November 18 (“Musical Theatre Night”), December 16 (“Holiday Extravaganza”), January 13, February 17 (“Math Night”) and March 17, and this year’s PlayGround Festival running May 8-25, 2014 at Thick House. 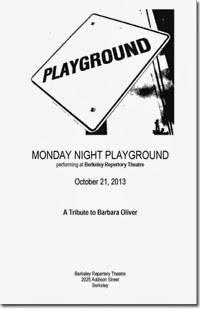 The reservation deadline for the October 21 Monday Night PlayGround 20th Season Opener and Barbara Oliver Tribute is Friday, October 11, 2013. For more information on pricing, ad sizes and deadlines or to make your ad reservation today, visit http://playground-sf.org/advertising.